I have had heavy bangs for about four years, and now that I have been wearing glasses (generally oversize glasses, at that) on a near-daily basis, the bangs are really starting to aggravate me. It makes me crazy when I see them peeking out from under the top of the frame, or flopping over. I don't like to have them cut too short, and they stay at the ideal length for glasses for about one week only. As many of you know from personal experience, growing out bangs is a tedious process requiring patience that I don't have, particularly when I come across a picture of a pretty brunette with perfect hair (French girls from the 1960s and 1970s, for example, usually have me running for the bathroom mirror & scissors). Recently Bre mentioned that the nice thing about bangs is that it's an instant hairstyle and you don't really have to do anything else. Pretty great, right? And how cute is a thick fringe with a ponytail? But it's time to let them go. I was flipping through recent issue of Russh magazine when I was reminded of the Rodarte Spring 2011 collection. Perfect hair! 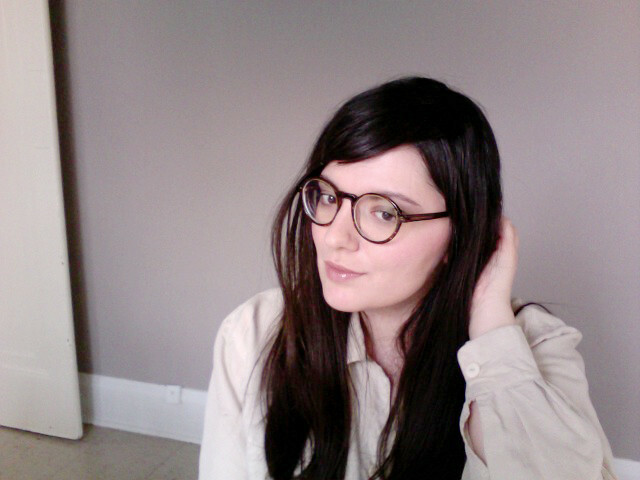 I decided to attempt a faux side sweep that would bury my bangs (hey 'sup, Photo Booth?). It looks a little like a combover (because it is one), but it works for me! Now to collect some pretty barettes, which I have not used since I was a child. Many of you are very observant so I will admit here that, yes, I ordered the Warby Parker Munroe glasses, even though I didn't need them, and I love them! I'm happy that I took the plunge. -Geoff and I snuck in to an abandoned building this weekend! It was pretty creepy! -I was interviewed for the Worn Fashion Journal blog! -we're participating in this raffle to raise funds towards relief efforts in Japan -- I'll share more details once I have them. -one of my sweet sponsors, Nest and Forest Vintage, is offering a coupon code to readers of this blog: 20% off all orders with the coupon code SPRINGNESTER, good until April 4th. Janet, Juli, Arlie, Caitlin Rose, Beth, andrea: Thank you so much! Rhianne: Thanks! Rangefinders can be a little tricky (at least for me) but I love the hazy effect they can produce. Just love it. Try it! Lois: We got a couple of houseplants. It's not as fun to go in winter! I'm looking forward to going back in a few months, though. Definitely a nice trip to make. avalonne hall: Oh yes, I would love to take a trip to a conservatory! I'm sure in your part of the world (you're in SF now, correct?) you have access to some beautiful plants and flowers! jokemijn: That is so sweet of you to say! Thank you. hila: Oh there is plenty of black in mine! I think it's necessary. I just happened to be really attracted to soft shades at the moment, but black is forever! I had the side sweep thing for ages--I loved it because of barettes! My favorite thing was to tie the sweep side up with a floppy bow. But, the pull of all the things you said drew me in--you did too! You have the blunt bangs I want! ahh! But (but but, so many buts starting sentences) you're lovely no matter what! I adore this look. It's always nice to change too, I think! The glasses look rad. I think you're completely justified having many (many, many) options for something you wear on your face every day!! You look lovely. I love the glasses, too! I rock the side sweep & glasses! I'm looking into Warby Parker's site as we speak. My prescription is so bad that if the sunlight were to penetrate through my lenses, you could literally fry an entire breakfast on those things. I hope they are able to accommodate my terrible prescription without them looking like Coke bottles lenses! YES!!!! I LOVE this Anabela! I have been thinking of changing my bangs as well since we had drinks at the common. My glasses are always dirty ever since I got bangs. And they are definitely annoying with glasses. I wish I could wear contacts. I have always loved barrettes. You look super cute with this look. Oh yeah, this is my go-to style and you definitely don't need bangs for it! Comb your hair forward across your face, pick a part, and loosely sweep hair to the side. Pin behind ear! Good luck! I've loved this hair style for so long now! I think it all started with Blythe dolls - they often have that side sweepy thing going on. And it definitely goes with my glasses much better/easier than a fringe. Cute barrettes for my thick hair are so hard to find though - those nineties favourite baby Goody ones just won't do! I've been sporting a thick fringe for four years as well and the "instant hairstyle" is what makes it difficult for me to say goodbye. Still, seeing I'm not the only one in this situation is encouraging, I really like the solution you came up with! I know how you feel! I've been battling the bangs+glasses+short hair= helmet head look for a year. Finally feeling better about it, now that my bangs are a bit longer. Will never give them up though, I love them! You are too cute! Love those glasses. I have been wearing my hair just like that recently, and with my old man glasses (trying to convince specsavers to put lenses in was so hard)! Must be a spring thing!! you know, i was this close (just imagine my index finger and thumb almost touching) to getting bangs cut last week. i just feel like i have so much hair, and i never know what to do with it. but then, i had a moment of clarity and saved myself from heartache; every time i've ever gotten bangs i've regretted it about 20 minutes later because i know how long it will take them to grow out. you look great with bangs, but you're pretty enough to pull anything off. You look lovely in your picture. The side sweep definitely suits you. I'm at a similar stage - growing my fringe out without much conviction, fully expecting to cut it again! Hair decisions are tough. love the glasses Anabela. I haven't had thick bangs for about two and a half years. I must admit, I do miss having bangs (they're cute!). But I also love all of the things that I can do to my hair sans bangs. Besides...you can sweep your hair over to make it look like you have bangs as well! crazy about warby parker - yours look great. great side sweep - as mentioned on facebook... i just may be trying this soon myself! a cowlick and naturally curly hair just don't go well with heavy bangs. congrats on the worn feature! you deserve it! Argh, i know what you mean! I used to get blunt cut bangs cut every fall, and as they grey out i'd have my hair lady layer them into side sweeping bangs. But i'm tired of going back so often to get them trimmed to perfect length. So i'm growing my bangs out (they're about chin length now!) So perfect for the Rodarte look. I found some cute pink Minnie mouse barettes i had from when i was a little girl. This made me smile so much, because I can completely relate! I have had bangs for over 7 years, and finally I just can't wait to grow them out! I am so ready for something new and fresh, even though I love bangs. Growing them out has been extremely painful so far. I just resort to pinning them back or to the side with bobby pins. Just today my boyfriend asked why I always pin my bangs back, and he looked so confused. I replied "Because I'm trying to grow them out and they are in a terrible in-between stage! I can't wear them properly in the front because they're too long now, but not long enough to stay pushed to the side with the rest of my hair!" Sorry for the exceedingly long comment, I am just so thrilled to have found an ally in the bang-growing journey :) And thanks for the inspiration from Rodarte- definitely have to try that. Ah, the side sweep...possibly the closest to bangs my large moon face will allow me to get! I want bangs, I covet bangs, but every time I fiddle with the front of my hair or ask my girl at the salon if she thinks I can pull it off, we both take a look then a big fat, OH NO! comes out of our mouths. you look so pretty anabela! i love the new glasses. 1, Side swept bangs = yes! 2. Warby Parker Monroe Glasses - yes yes yes!!! I want them too, but there are just too many pairs of glasses that I want. I really want round glasses a la Anna Karina! Those glasses look perfect on you! 3. Yes, I'm in San Francisco right now... well actually in Hong Kong right NOW... Spring Break. Heh. 4. I love abandoned houses. I love claw foot bathtubs! just got me some warby parks in the mail the other day too. though i may like yours way better. i didn't see these! glad i'm not the only one with this problem. i had heavy bangs that i loved but when i started to wear glasses full time it was just too much for my face. ever since i've been struggling with what to do with them - this is great inspiration, thanks! Abandoned buildings are my favourite! I'm so happy for imminent spring so I can get out and do some exploring! Such a pretty old bathtub in your photo. I love the pinky tones of this photos and a good side sweep. Your hair is gorgeous with bangs or with the sweep. I've been thinking about getting my bangs back, but every time I think I'm going to make the change I think better of it and hold off. When I was a kid my hair idol was Sarah from Labyrinth. I thought she was amazingly cool. Side swept looks good on you! I've grown out my bangs so many times. I've finally grown out my previous ones down to my chin. The problem is I think my face looks plain without them, so I keep cutting them again! Girl you NEED the barrette that Elle Fanning wears in that new Rodarte film. OMG, when I saw that thing I wanted to grow my bangs out just for the hair accessories. at least you have LONG hair and you are trying to grow out bangs! i have a short, shaggy hairstyle and i side-sweep my bangs .. and i get endless justin bieber references daily! booooo! Awh you look mega cute! don't grow out the bangs/fringe (ahem)...just sweep 'em over one day and brush them down the next. the fringe rules. Nice glasses too! This was also a hairdo I was eyeing too. Look for barrettes this weekend, note to self. But yeah, seriously haven't worn one of those since I was a kid! Those glasses frame your pretty face so well. I recently had my bangs cut to be a lil shorter & sweepy because YES! glasses + bangs is a tricky thing! Mine were longer, but they'd get stuck in an awkward place under or over my glasses. Also, the round glasses look so good on you! Someone commented on my blog that the Begleys didn't look great on me because the top of the frame goes above my brow line and makes my eyebrows look odd, and at first I was like EF YOU! But then I realized it was so true. So now I'm not going to get them, and the hunt continues. I guess I have a short eye area? ha. it's a complete visual feast (and inspiration) for this phase i'm going through with my mane and wanted to thank you for it. I know exactly what you mean re: bangs with glasses! It's exactly why I don't wear my glasses as often as I would like...Once they're too long, should they go on top, or under my glasses?! It's so frustrating! Great hair...I fluctuate between bangs (or a fringe as we call it here!) and side swept fringe. I can never make up my mind which I like best! Good to mix it up a bit...you look awesome! Anabellabella, you look absolutely adorving, and give me hope for my impossibly annoying growing-out bangs. im also growing out my bangs right now. every time i get a glimpse of them, i want to go edward scissorhands on them. however, rodarte has also been my inspiration to keep the scissors away. its a good one! Great post! 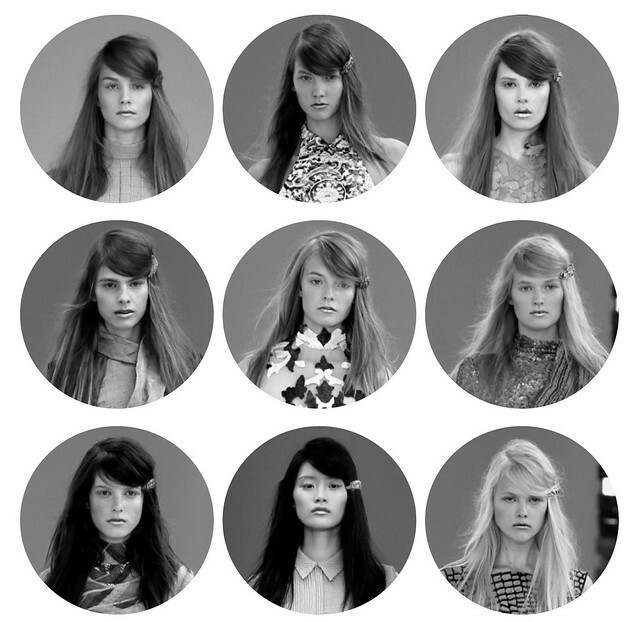 I love the collage of looks from Rodarte, as that was one of my favorite collections. So so good.